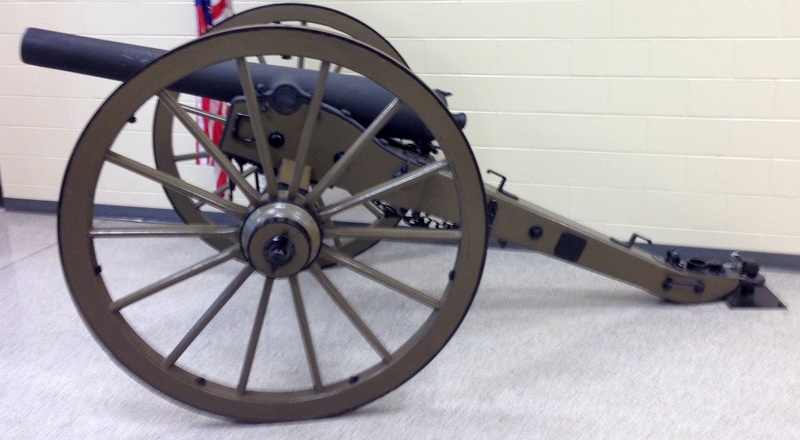 This exhibit tells the story of the journey of Monmouth College's Civil War Cannon. The story of Monmouth College's cannon began in 1903 when the senior class decided to donate a cannon from the Civil War to Monmouth College as their senior class gift. While this was a fantastic idea, the rivalry between the senior and junior classes drove the junior class to steal the cannon before it was delivered to Monmouth College. There were nine male students from the junior class that were involved in the cannon theft. The students dumped the cannon into Cedar Creek, where it remained for almost 49 years. A search team led by Garrett Thiessen found the cannon in Cedar Creek, and they brought the cannon back to Monmouth College. Because they were worried about a possible second theft, Dr. Thiessen buried the cannon in the ground and poured concrete over it for safe keeping in 1952. In 1996, a group of faculty decided to dig up and restore the cannon. Today, the cannon is stored in the Huff Athletic Center at Monmouth College, and the cannon is fired at Monmouth College Homecoming football games when touchdowns are scored.